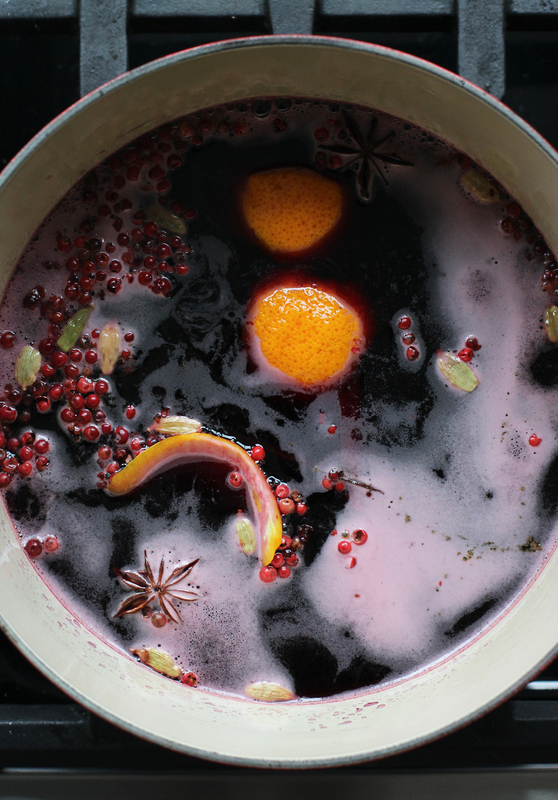 I stumbled upon the idea of mulled wine syrup by mere happenstance. An extra half cup of sugar, which was serendipitously dumped into a pot of simmering mulled wine, gave my favorite holiday drink a thick, syrupy consistency . . . and then the lightbulb went off. Let’s pour this doozy over ice cream!! So here it is, a spiced wine syrup that is so luxuriously delicious and easy to make, it’s officially become a tradition in my household. Mulling spices and ingredients vary drastically – it really just depends on your personal taste. 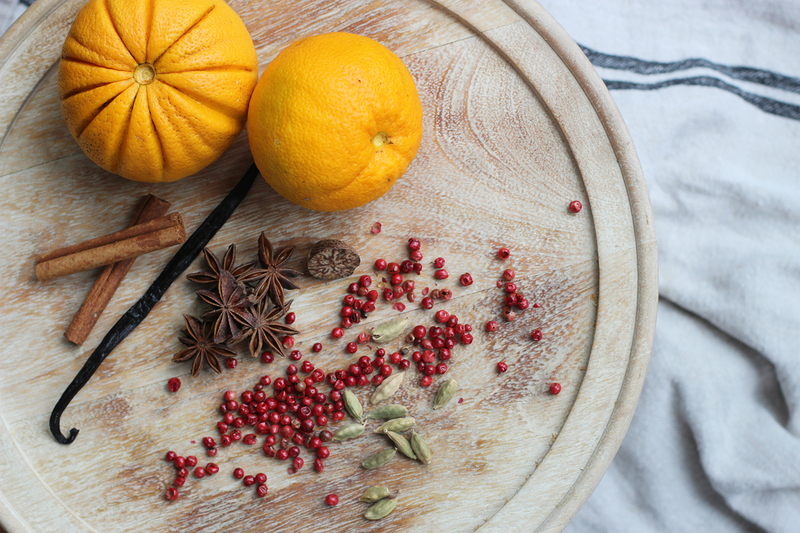 I love orange peel, cinnamon sticks, star anise, nutmeg, cardamom, vanilla bean and pink peppercorns in my mulled wine. It helps to toast the spices in a pan, over medium heat, for a couple of minutes to help release all oils and flavor. Combine a bottle of red wine (I used an inexpensive Cabernet Sauvignon here), the spices, split vanilla bean, orange peel, and sugar into a medium sized pot. Bring it to a boil and then simmer it for about 20 minutes until it reduces to about half the volume. Let it cool overnight and strain it with a fine mesh strainer into a jar. It can keep in the refrigerator for about a week. 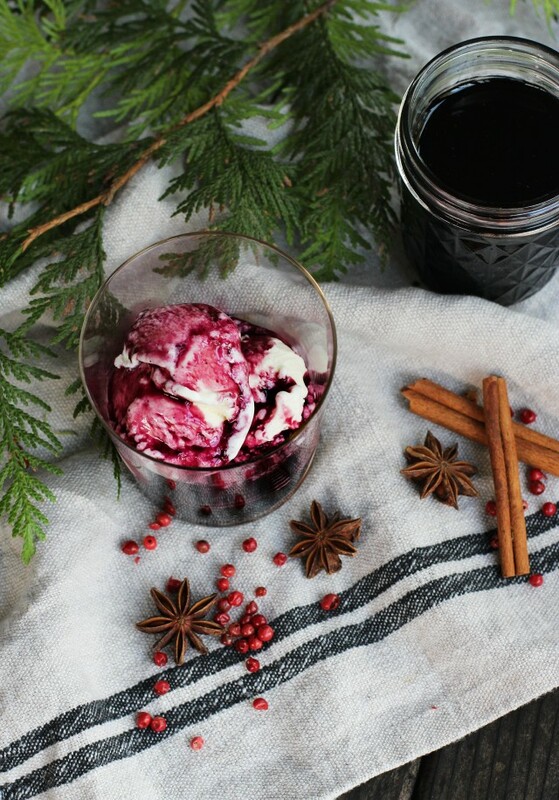 When you’re ready to devour it, simply pour it over vanilla ice cream! I imagine it would be just as delicious over a stack of pancakes or swirled into plain yogurt. Yum. Or even added into a cocktail. Todd?? toast the nutmeg, cinnamon sticks, cardamom, star anise and peppercorns on a pan, over medium heat, for about 2-3 minutes until fragrant. One variant, mix red wine wine Porto wine, delicious. 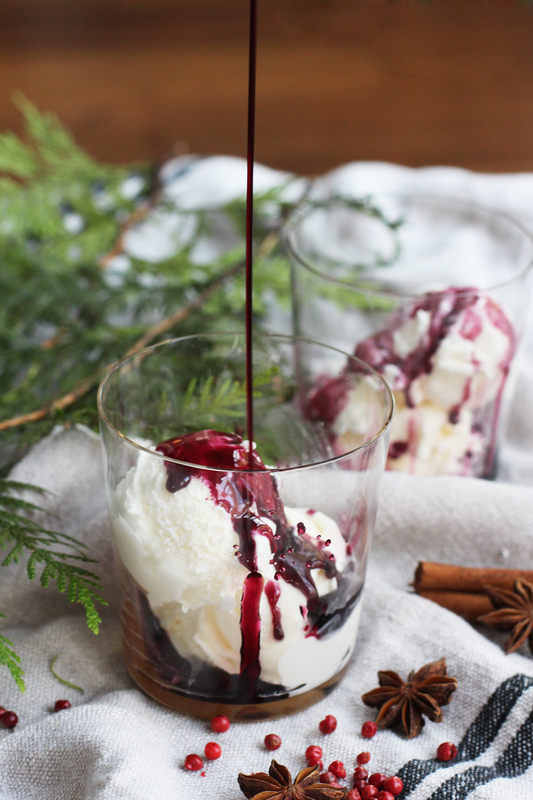 With this wonderfully festive syrup recipe, I can drag out Christmas well into the New Year! 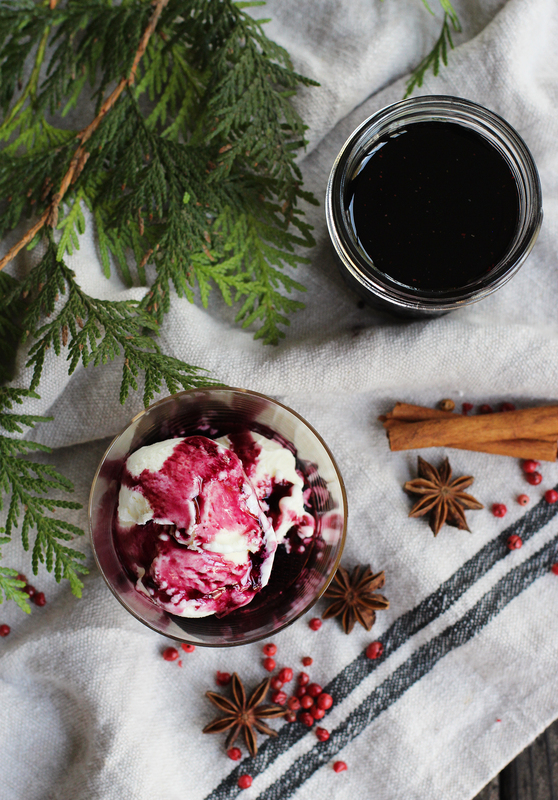 What a gorgeous syrup, this is a perfect ice cream topper! This is so creative, and beautiful! What a happy accident! This is fantastic!!! This looks divine! Great idea – going to give it a go tomorrow night in time for Christmas day. Definitely going to try and get it into a cocktail too!